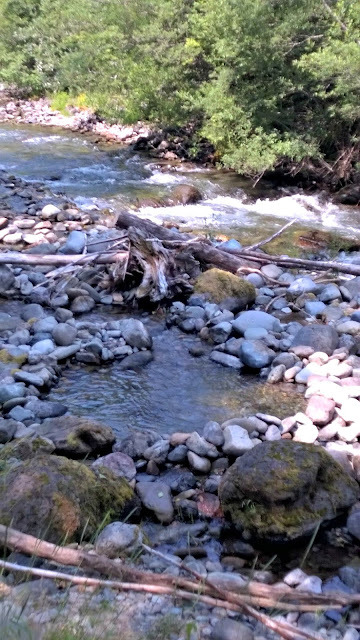 As I’ve said before, the Pacific Northwest is nature’s playground. Just a short drive leads you to desolate, private, and primitive (read: no cell service or toilets) camping areas with amazing views. We have a camping area in Mount Rainier National Forest near Greenwater, Washington that, for selfish reasons, I cannot divulge the exact location. You can find many more campgrounds like it here. 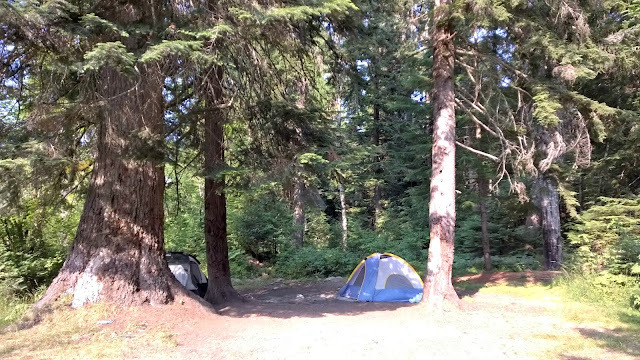 Our particular campground is owned by the forest service and is first come, first serve and very primitive. Now, if you’re from the PNW you know we’ve had a hot and dry summer. In fact, it was in the 90’s when we went camping. Hot and dry summers mean forest fires. And forest fires mean fire bans while camping. We didn’t know this at first (we checked the websites and thought where we camp was OK for fires, but the campsite had no fire signs posted everywhere), and were not prepared with a gas stove. My advice, contact your ranger district before your trip as rules vary from district to district and different elevations have different rules, too. So, this is what our fire pit looked like. Camping without a fire is lame, by the way. 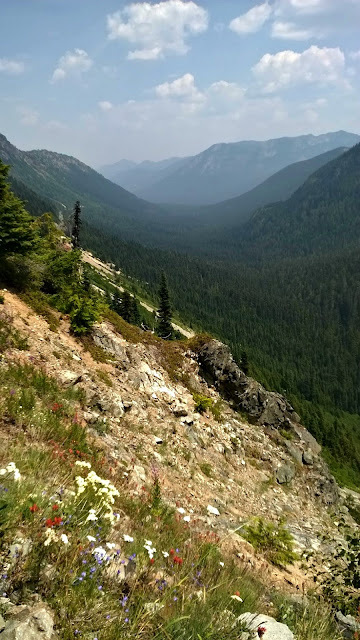 We woke up fairly early the next morning, ate breakfast that didn’t need to be cooked, and headed to Chinook Pass where Marissa had found us a nice hike up to Sheep Lake. 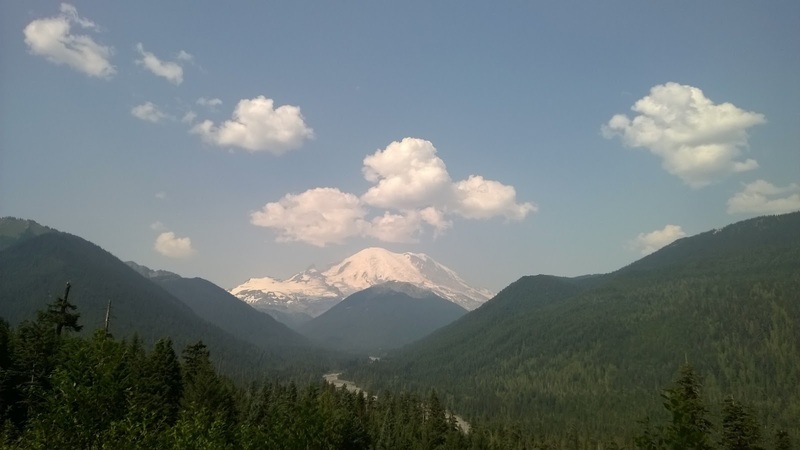 On the way, off Highway 410, there is a pull out that offers amazing views of Mount Rainier. 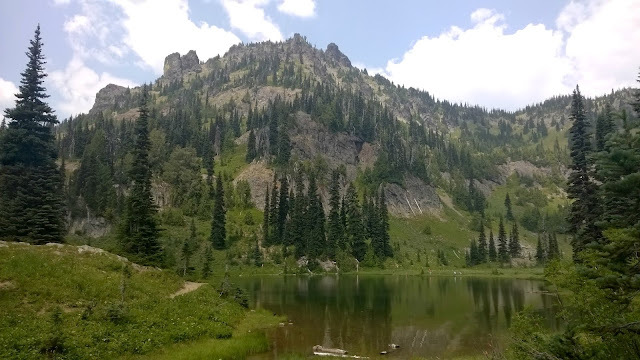 We continued our travel on Highway 410 and found the trail head for Sheep Lake, part of the Pacific Crest Trail (it’s just past Chinook Pass). The trail head starts on the side near the toilets. 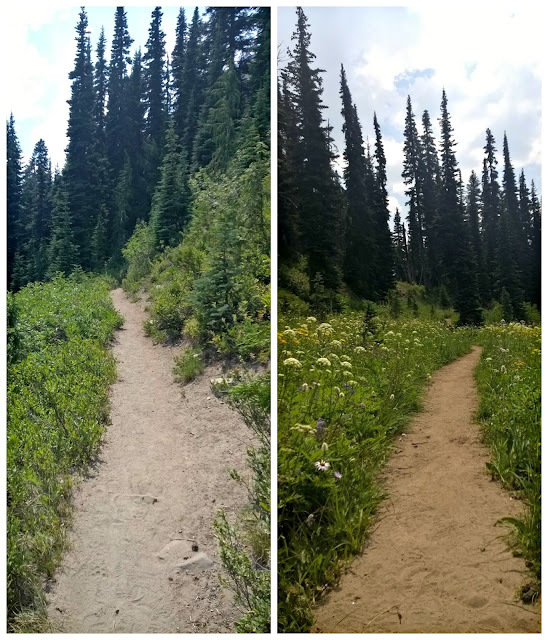 The trail was pretty easy, and you only gain about 400 feet in elevation. 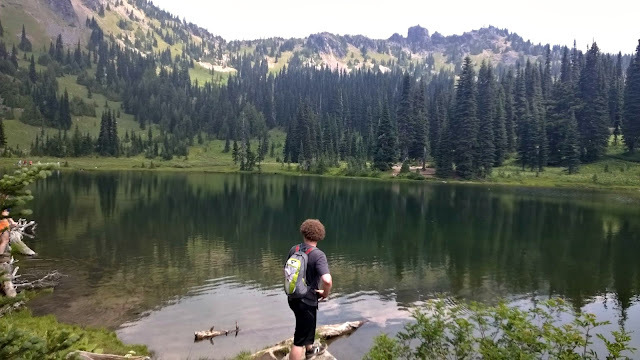 The hike to Sheep Lake was 2.1 miles and not too strenuous. While the path was mostly clear, there were a few parts of the trail that were rocky and jagged, and if you fell off the trail it’d probably hurt, as it’s a steep fall. While walking on the trail, take a moment to appreciate the view of Chinook Pass. 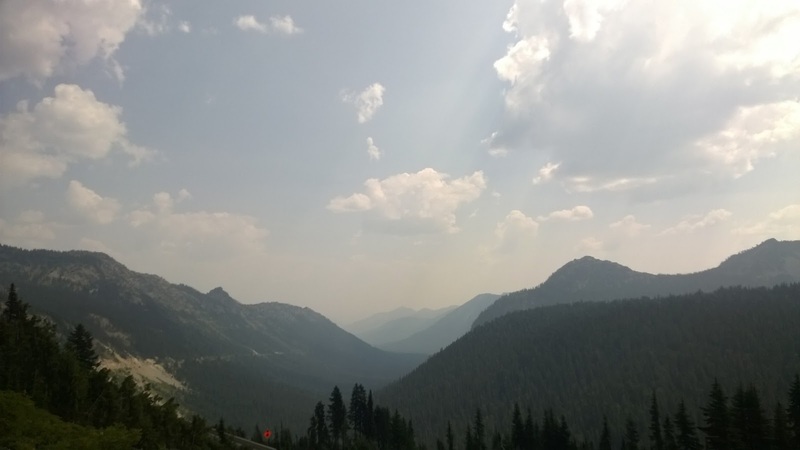 This day is was particularly smokey, due to the forest fires not too far off. 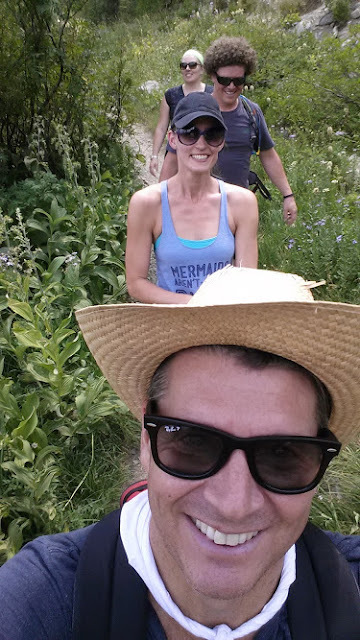 And this is what we look like when we hike! 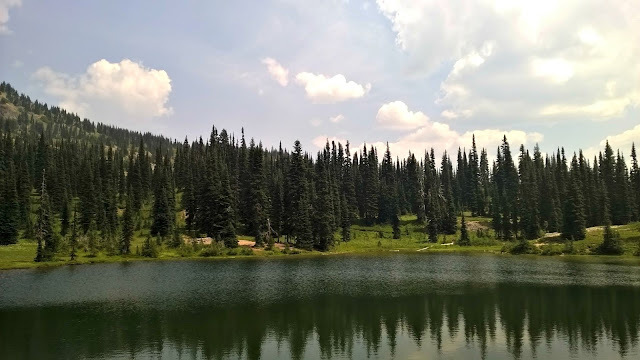 After the trail evens out, seemingly out of nowhere, a beautiful alpine lake greets you! It was really peaceful near the lake, so we sat down and ate lunch right here. After lunch, we decided to jump in and swim. The water was freezing (it is an alpine lake, after all) but quite refreshing. There were a lot of fish jumping in the lake, and that was fun to watch while eating lunch, too. After lunch and a swim (and Chris’s handstand), we circled the lake, and headed back down the trail to the car. It was approaching 2:00 p.m. and getting very hot outside, too. 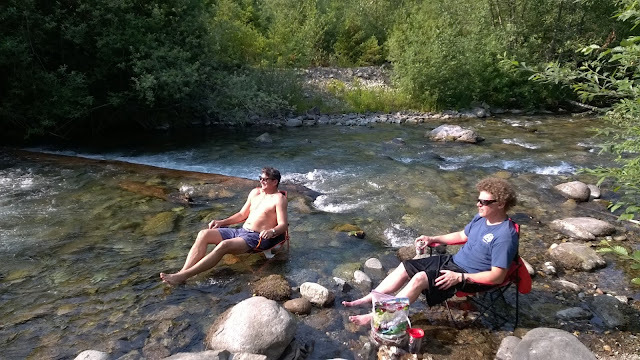 Our particular campsite is adjacent to a river, and it was hot out (really hot), so Chris had the genius idea of putting our chairs into the river. Bonus, the river also keeps drinks cold. And Chris is crossing the logs. We were hoping he’d fall in. Sadly, he didn’t. After playing in the river, we took mini-river showers and got ready to go out. Since we couldn’t cook our food, we decided to head to Greenwater for some burgers and snacks. 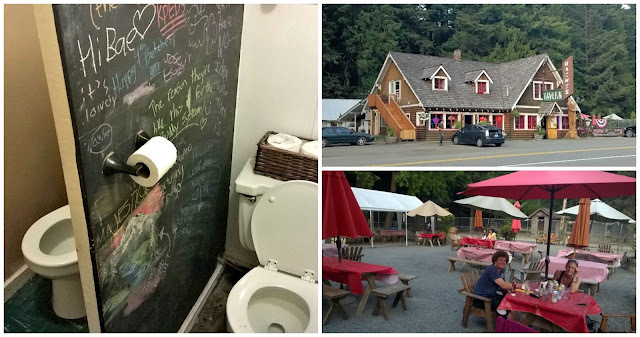 Naches Tavern is kind of awesome. Inside they have pool tables, pinball, and a bunch of cool stuff on the walls. Outside they have picnic tables and horseshoes! The bathroom has two stalls, no door. Oddly enough, this is not the first time I’ve blogged about a bathroom like this. Oh, on the bathroom stall it said, “Joel McHale from the Soup ate here once.” Good to know. 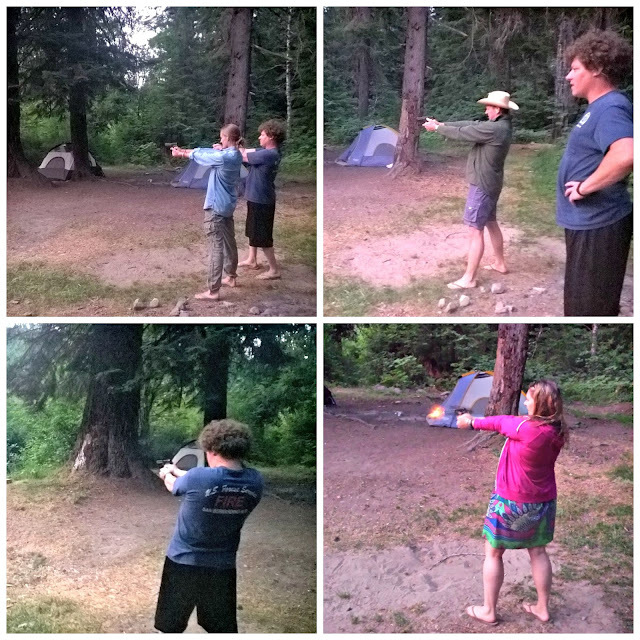 After properly filling our bellies and playing horseshoes, it was back to camp for some target practice. Chad is an excellent teacher and he gave us a gun safety reminder course before letting us shoot at targets. We all actually did a good job, but Chad might have hit more targets than the rest of us combined, whatever. But, no one did a better happy dance than Marissa when she hit her first target on the second shot. The gun we shot was a Sig Sauer p225. And yes, it is totally legal (we checked first!) to shoot a gun in the National Forest. There are some federal rules to follow and each forest may have their own rules, too. Check with your local ranger station to make sure you’re compliant. And, please, always be safe when handling a firearm (and wear earplugs, too!). We went to bed earlyish again. We were tired from our hike, plus no campfire for light. Something freaky happened though, some people were shining bright flashlights on us from the road. 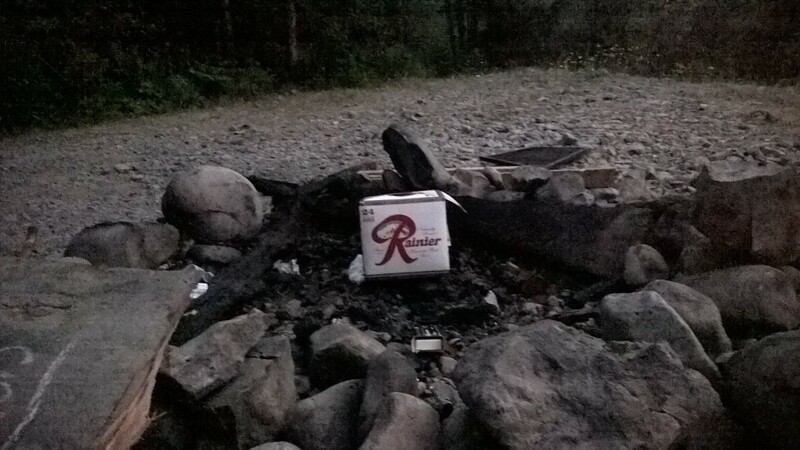 It was probably just a ranger checking for a fire, or people wanting to camp at our spot, but still, it’s weird when that happens. 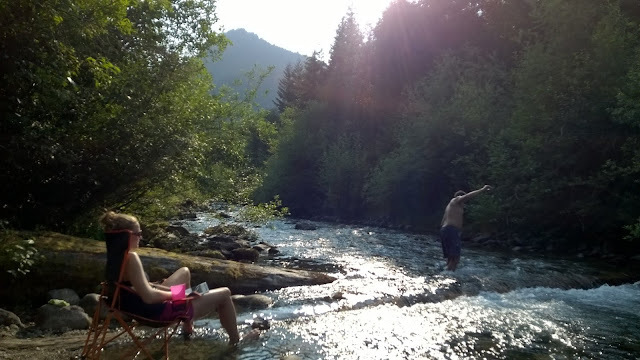 The next morning, I took an “alpine shower” in the little rock pool near our campsite. It’s cold, but did the trick. I use Campsuds, as to not harm the surrounding water. Also, I won this random camp shower (similar to this one), at a trade show many years ago that is wonderful for camping. and allows me to wash my hair. On our way back home, we stopped at a campsite that allowed fires to see if we could grill in the picnic area. Well, Marissa and I both were stung by a hornet. It got me on my left bum cheek and Marissa on her ankle. Hornet bites freaking sting! We did have some hydrocortisone which helped, but man, I felt that for two days. Hiking on our second day was kind of off, so we went to Greenwater to have a beer, a bite, play horseshoes, visit the gift shops, and eat ice cream. 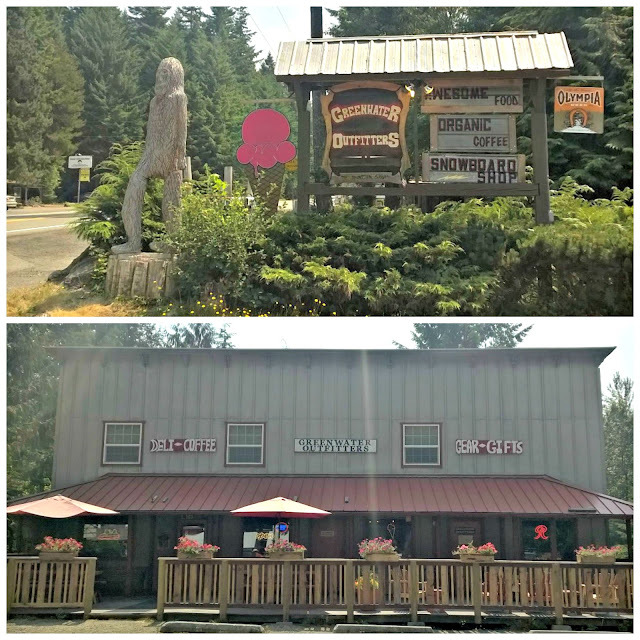 There are two places to drink in Greenwater (well, three if you count the little grocery store that does sell beer). Naches is one, Greenwater Outfitters is the other. 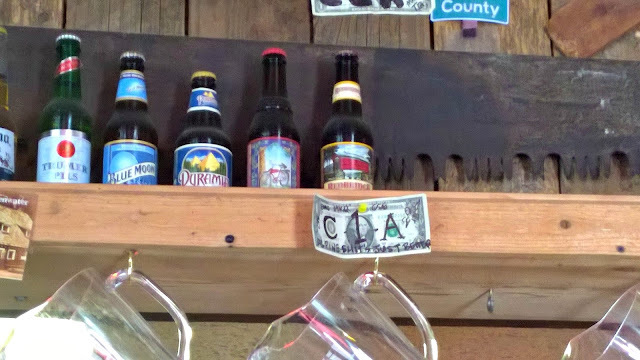 We had a good time at Greenwater Outfitters, drinking a few beers on the patio, chatting with owner about the place. Turns out the Sasquatch carving out in front was done by a friend of the owner, and it was his first piece (his second piece is across the street at Naches). 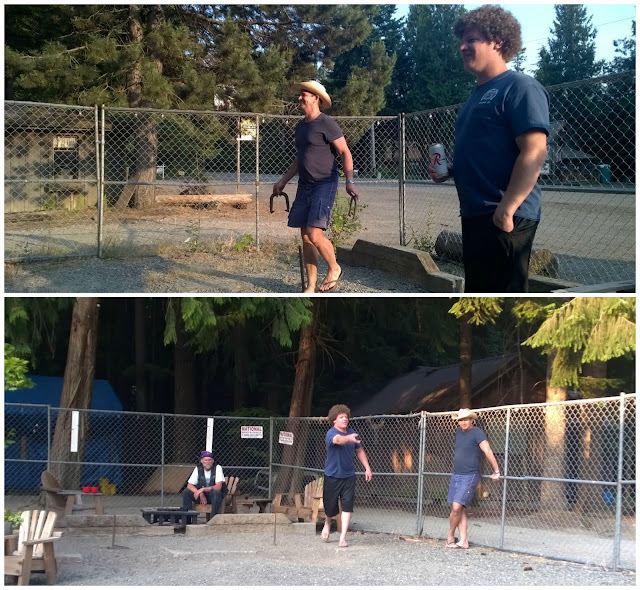 Then we “pub crawled” across the street to Naches Tavern get a bite and play horseshoes. 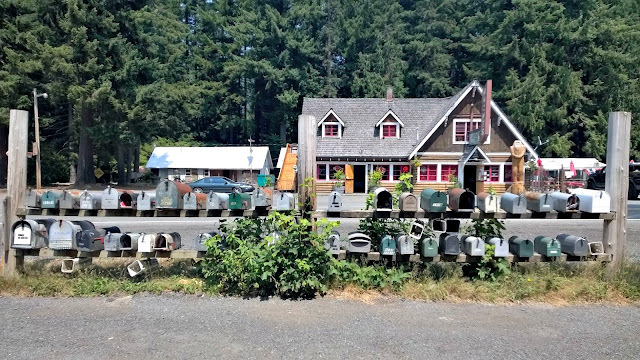 But first, mailbox picture? And the daring one that I am, I ate a pickled egg. 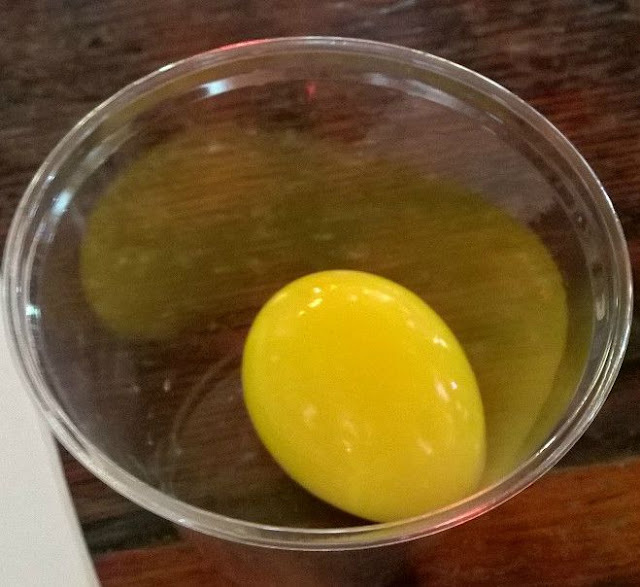 It wasn’t very awesome, and I was warned by the bartender that I probably wouldn’t be thrilled with it. Ate it anyway, as did Chad. Yeah, um, I regretted it. But the other food at Naches is pretty good, so don’t let my stupid pickled egg experience deter you. 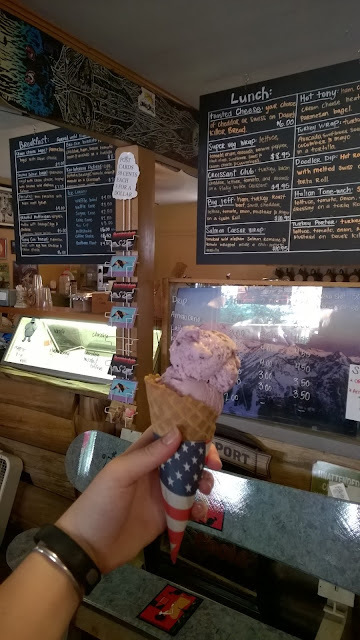 Then it was back across the street for ice cream (which if you’re getting ice cream in Greenwater, Greenwater Outfitters has better pricing than the gift shop next door). And finally, it was time to head home. 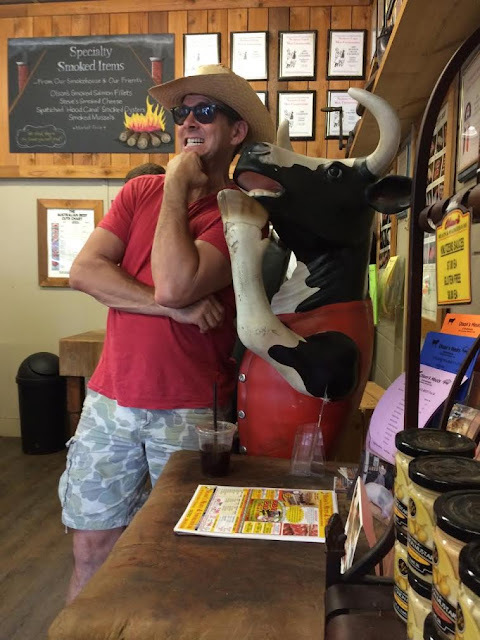 On our ride home we stopped at Olson’s Meat and Smoke House, where Chad and I grabbed some tri-tip and elk sticks and Chris found a new BFF. I am so glad we stopped here. We made the tri-tip that evening and it was the best tri-tip Chad and I have ever had. It was perfect. We plan to go back to Olson’s and buy a meat pack on our next trip. One more stop that is, sadly, not pictured was our stop at Cowgirls Espresso in Enumclaw. For just a few bucks we received cold brew coffee, and one crazy story about a breakup, a trip to Mexico, and stealing from her mother, from the girl making our drinks. Totally worth it. Camping within a 90 minute drive from home it awesome. It’s like you’re in a whole different world, but you can easily get home. Make sure you’re prepared with enough water, food, and supplies. Check out REI’s camping check list here. You may need a park pass depending on where you’re going. You can read about the different types of car passes here. Greenwater, Washington is also known for Sasquatch and Bigfoot sightings, and was even featured in Joe Rogan’s Question Everything. Sadly, we didn’t find a Sasquatch. And if we had, in the tradition of Sasquatch pictures, our pic probably would have been too blurry anyway. Do you have a favorite camping tradition or camping gadget? I’d love to hear about it! Leave me a comment or send me a Tweet. Nice! A buddy and I are thinking of driving out to Greenwater to camp this Thanksgiving. Is it snowy up there, road-wise, this time of year?